What a wonderful way to organize your hair bows with an O'Sew Pretty personalized bow holder. 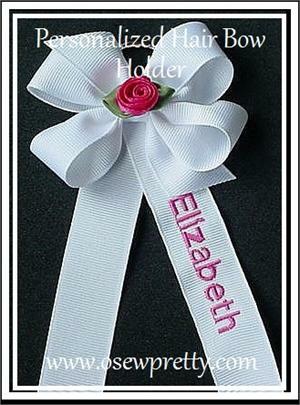 This is a must have personalized hair bow holder that holds up to 50 bows. Hair bow holder measures 3" across with two 36" streamers. FREE personalization with your choice of lettering style. Shown in white ribbon with shocking pink thread.